Here are some pictures of our first mammoth make of the week. 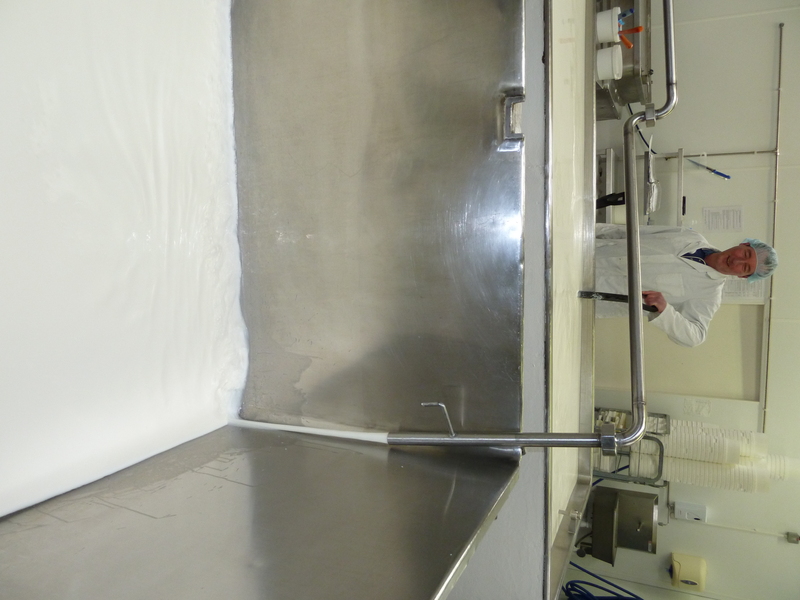 We have 1,950 litres in the large vat and 700 litres in the small vat. 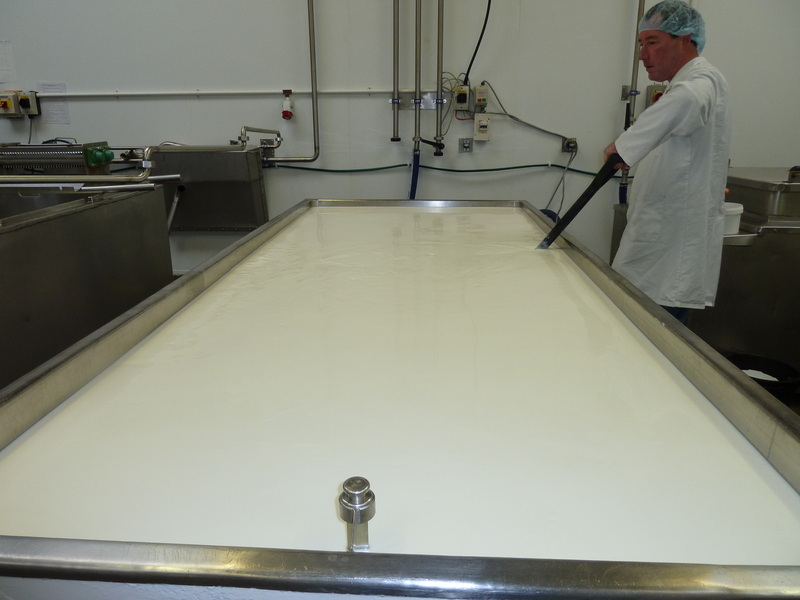 This is probably the most we have ever pasteurised and the poor old pasteuriser was getting very fed up towards the end and spluttering, but we made it. It will get a good old clean with nitric on Wednesday prior to processing 2,000 litres of sheep on the Thursday; it always gets a clean with caustic immediately after finishing pasteurising. 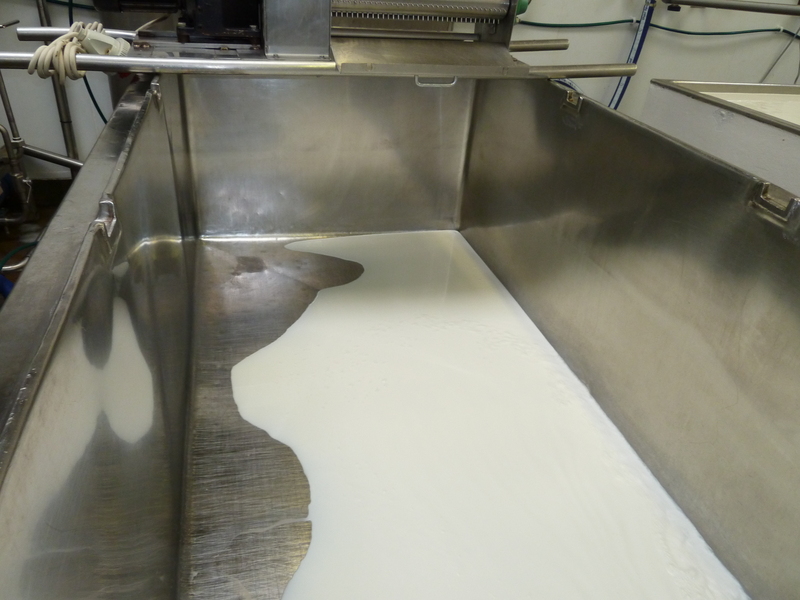 Nitric is a super cleaner and makes it run very fast which is what we need for the sheep as it is so rich, thick and creamy, it slows the pasteuriser down. hundred’ but on reflection, 132 ½. We will see! Wow that’s a lot of milk. Keep up the good work! HELLO IONA FROM YOUR NEIGHBOUR GEORGE – AM AT PIP AND REBECCAS AND THEY ARE SHOWING ME YOUR CHEESE ON TINTERNET!!! George again – do you have any food grade muslin I could buy from you? If so please give me a call 860249 or Pip and Rebecca 860075. What a wonderful surprise! Isn’t the tinternet a wonderful thing? Haven’t seen you in ages…we have a cheese box for you at work to replace the one that went. Hope your lambing is going well. How’s Miss Piggy and Mr Wiggly? Penny Pig has become very cunning at stealing the geese eggs before I can get to them and Snouter got very sunburned all down one side; his skin is bright red and very hot, poor piglet. I’ve been rubbing aftersun into his skin, not that he appreciates it. See you soon – and hi to Pip and Rebecca!